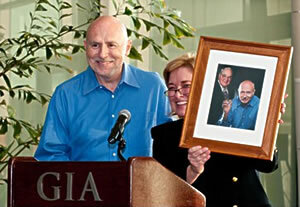 CARLSBAD, Calif. – Jan. 5, 2010 – The Gemological Institute of America (GIA) has honored John Koivula, Chief Research Gemologist with the Richard T. Liddicoat Award for Distinguished Achievement, the highest tribute the Institute can bestow upon an individual. GIA President and Chief Executive Officer Donna Baker presented the special honor to Koivula during a surprise ceremony on Dec. 17 at the Institute’s world headquarters in Carlsbad. Nov. 5, 2008 - The much anticipated Photoatlas of Inclusions in Gemstones, Volume 3, which completes the Photoatlas series, will start shipping Nov. 17th. This book is the culmination of 25 years of collaboration between John Koivula and Edward Gübelin. The work of these two inclusionists provides the gemological trade with a library of over 5,000 images spread throughout the three volumes of the series. If the release in London on Oct. 25th was any indication of the interest in Volume 3, then this book too will take its place along side the two previous volumes as a bible of gemological knowledge. Click here for additional information. The Gemmological Association of Great Britain hosted their centenary conference and the 2008 European Gemmological Symposium from Saturday 25th - Sunday 26th October, at the Hilton London, Kensington. A truly international gathering of gemmologists, laboratories, gem associations, jewellery trade and press were in attendance, with the weekend delivering an impressive array of presentations ranging from the history of gemmology to modern practical gemmology. John Koivula, whose highly anticipated Photoatlas of Inclusions in Gemstones, Volume 3 was "hot off the press;" those in attendance were eager to purchase copies.